Millions of happy clients (and well-fed birds) confirm that the patented Squirrel Buster™ system is truly squirrel proof! Openings in the outside section of the feeder (shroud) align with seed ports, providing birds access to the seed. 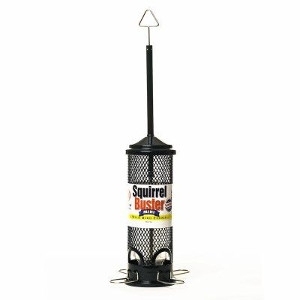 When a squirrel climbs onto the feeder, its weight automatically forces the shroud down, closing the seed ports. Squirrels are foiled, and not harmed in any way.